A Regex is simply sequence of characters that define a search pattern. This pattern is then compared with the target test string and will produce a match if the pattern allows. 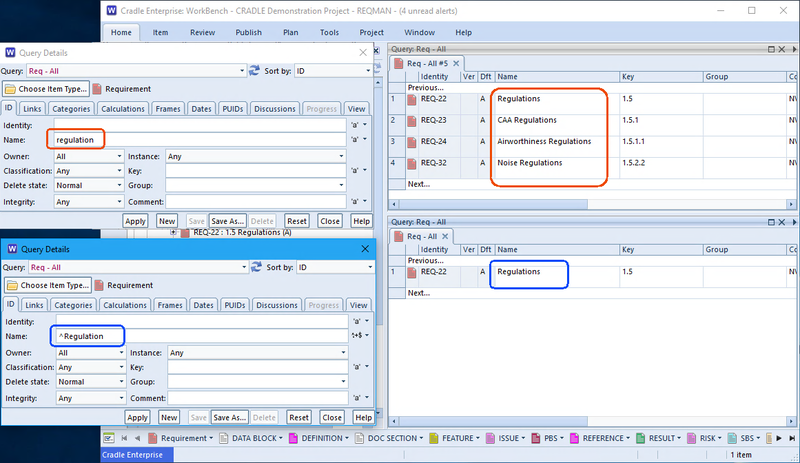 When retrieving information from the database, Cradle uses a query to filter the data returned. It looks for many matches against different aspects of the item. Wildcard matches are available on the Identity and the Key fields The ones most likely to be identifying a hierarchy. In the example below a query has been run with three values in the identity field. REQ-10, REQ-11, REQ-12 …. onwards a text match bringing back the matches greater than the stem. This is really useful for hierarchical numbers, bringing back the children of 1.1 (using 1.1.) say. REQ-1, REQ-10, REQ-11 a text match where the stem is followed by zero or more characters. This brings back the stem value too. Contains matches are available on Name and Comment fields. They are case insensitive and look for the string of characters anywhere in the component. This can be a little too wide. 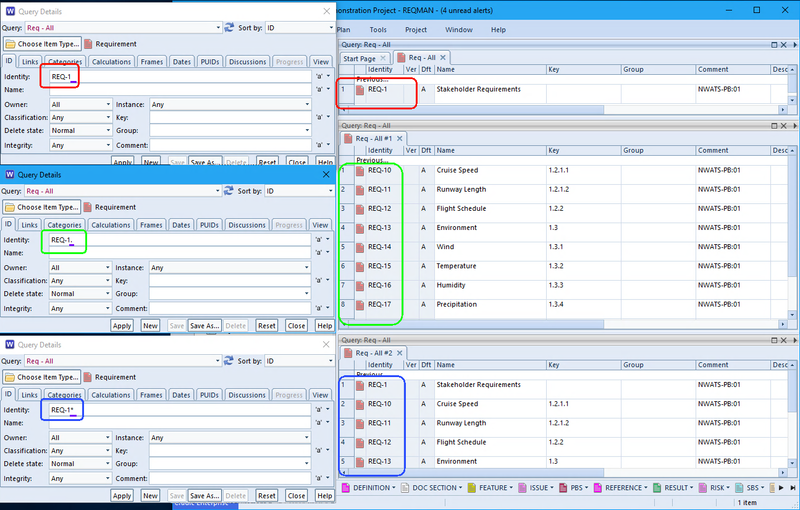 In order to provide more control it is now (Cradle 7.4) possible to switch to a Regex match. Choose the dropdown at the end of the field and select Regex Match. This will change how the search text is applied. “Regulations” only because the “^” at the beginning is a regex anchor to the start of the line. If we were searching for part numbers we might use ^Pt:[AB]+. * to bring back all parts starting Pt:A and Pt:B followed by any other characters. Databases have a number of keys and indexes. Cradle is designed to work with these to produce results most effectively. Wildcard endings are more efficient as they match the way the data is sorted internally. Regex expressions have to match against all database entries. therefore there is a performance implication to using this more flexible matching. This is why both methods are provided and users can switch whichever they want on. Can I check for frames that don’t contain digits?